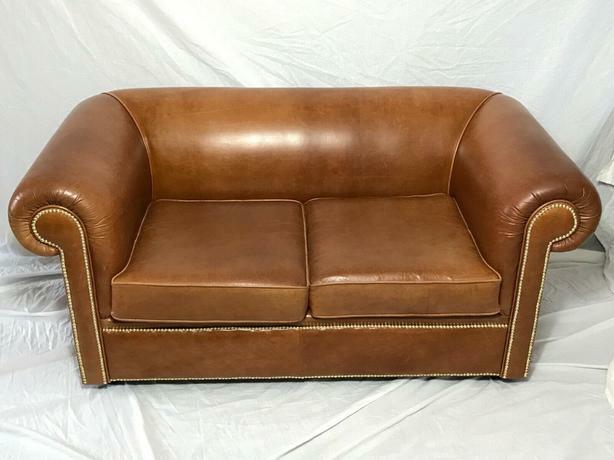 1 Classic Quality Handmade England Faux Leather Chesterfield In The Art Deco Style Sofa 2 Seater Settee Cognac Brown. The faux leather is of the very finest top quality. It is rather fine sofa and can seat 2 people as 5 feet & 55.5 inches in total length. Ideal for your living room. Having a beautiful classic stylish brass studded detail. Impressive cigar shaped armrests and having a low backrest. In the most sought after popular light cognac tan brown colour. It would compliment any interior design home theme. Fire safety compliance label present underneath seat cushions. Handmade in England label also underneath. Please note only 2 of the Union jack cushions are included with the full asking price only. Offered in rather fine used condition. Ideal if you love the worn used look. Having some noticeable stains,wear & scratches, small black pen ink marks on the lower front back seat rest. 1 small red ink mark on inner side. Slight bulge on 1 front cushion.